The Karnak Temple Complex, commonly known as Karnak (/ˈkɑːr.næk/), comprises a vast mix of decayed temples, chapels, pylons, and other buildings. Building at the complex began during the reign of Senusret I in the Middle Kingdom and continued into the Ptolemaic period, although most of the extant buildings date from the New Kingdom. 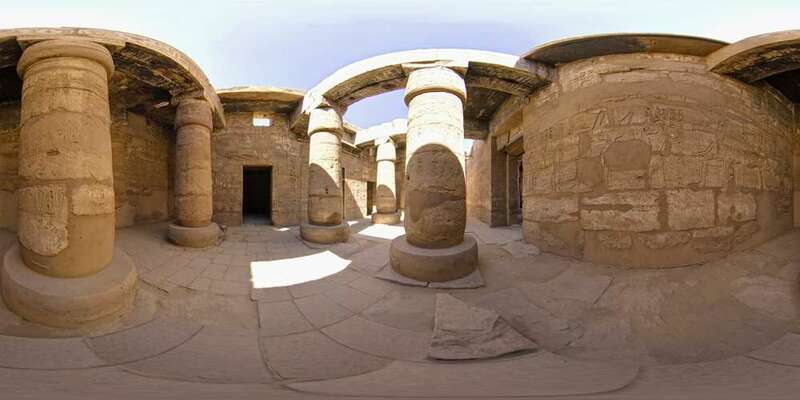 The area around Karnak was the ancient Egyptian Ipet-isut ("The Most Selected of Places") and the main place of worship of the eighteenth dynasty Theban Triad with the god Amun as its head. 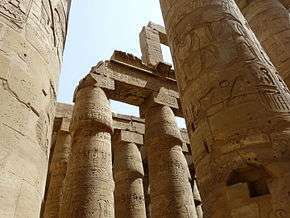 It is part of the monumental city of Thebes. 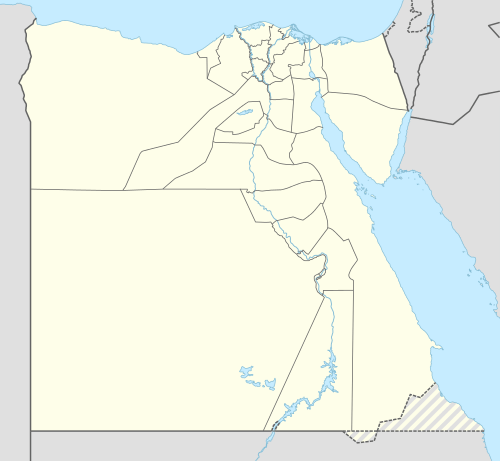 The Karnak complex gives its name to the nearby, and partly surrounded, modern village of El-Karnak, 2.5 kilometres (1.6 miles) north of Luxor. 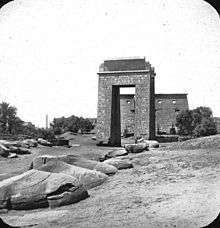 Also, Karnak was a high-precision ancient observatory according to Norman Lockyer. Thebes' exact placement was unknown in medieval Europe, though both Herodotus and Strabo give the exact location of Thebes and how long up the Nile one must travel to reach it. Maps of Egypt, based on the 2nd century Claudius Ptolemaeus' mammoth work Geographia, had been circling in Europe since the late 14th century, all of them showing Thebes' (Diospolis) location. Despite this, several European authors of the 15th and 16th century who visited only Lower Egypt and published their travel accounts, such as Joos van Ghistele or André Thévet, put Thebes in or close to Memphis. In 2006 Betsy Bryan, an archaeologist with Johns Hopkins University, excavating at the temple of Mut, presented her findings about one festival that included apparent intentional overindulgence in alcohol. Participation in the festival was great, including the priestesses and the population. Historical records of tens of thousands attending the festival exist. These findings were made in the temple of Mut because when Thebes rose to greater prominence, Mut absorbed the warrior goddesses, Sekhmet and Bast, as some of her aspects. First, Mut became Mut-Wadjet-Bast, then Mut-Sekhmet-Bast (Wadjet having merged into Bast), then Mut also assimilated Menhit, another lioness goddess, and her adopted son's wife, becoming Mut-Sekhmet-Bast-Menhit, and finally becoming Mut-Nekhbet. The British symphonic metal band Bal-Sagoth have a song called Unfettering the Hoary Sentinels of Karnak. The first part of the modernist long poem, Trilogy, by H.D. is dedicated, "For Karnak 1923". According to the Stargate SG-1 episode Serpent's Song, Apophis' host was a scribe in the Temple of Amun at Karnak. 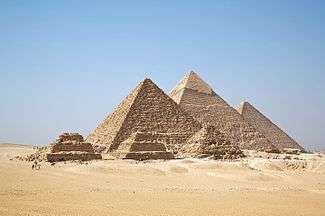 In the original Battlestar Galactica series, For Lost Planet of the Gods, Part II, some shots of the pyramids at Kobol were actually filmed at the site of the Great Temple at Karnak and the Pyramids of Giza, in Egypt. In the Big Finish Doctor Who audio play The Church and the Crown, Erimemushinteperem introduces herself as princess Erimem of Karnak at the court of King Louis XIII of France. Karnak is the name of the Antarctic retreat of Ozymandias, one of the main characters in the 1980s comic Watchmen by Alan Moore and Dave Gibbons. ↑ Lehner, Mark The Complete Pyramids, London: Thames and Hudson (1997) pp.202–225 ISBN 0-500-05084-8.